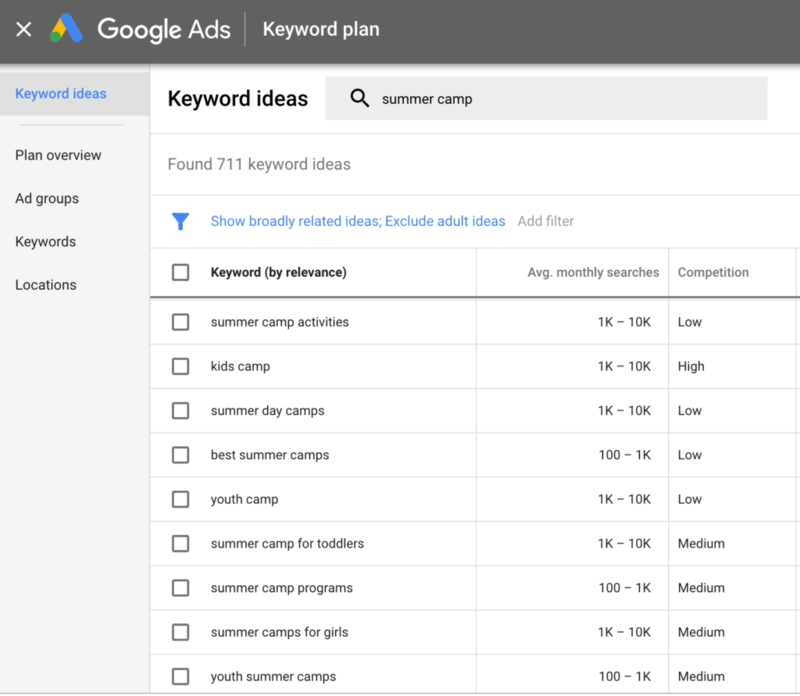 Summer Camp Marketing includes a focus on getting found in Google searches. It’s getting to be summer camp registration time! While some camp programs have a waiting list within hours, others may struggle to bring in new campers. Most parents pick camp programs based on reputation and word of mouth in their community, but many people rely on a Google search to look for summer camp options in their area. For this reason, ensuring your website is utilizing effective summer camp SEO practices and your business is taking steps to be found near the top of Google searches is important. We create and manage websites for kids camps and enrichment programs and schools, and work with our clients to help them try to improve their search results. Google’s auto-suggest is a great way to get keyword ideas to find words people are actually using in searches. Use Google’s related search ideas to increase your keyword idea list. You can also use Google’s Keyword Planner to expand your list and get a general idea of whether your chosen words will be hard to rank for (more competitive) and a range estimate of search volume for each keyword/phrase. This tool is free if you set up an Adwords account (you don’t have to advertise to use this tool). Google Keyword Planner is a good source for keyword ideas. Homepage: Make the most of the meta data for the top pages of your website, especially the Home Page. We use the Yoast SEO Plugin, which makes it easy to customize the SEO Title and Meta Description for pages and posts on your WordPress website, as described here. Your home page copy should contain 500 to 1000 words and should be clear and compelling. Be sure to include a good description of your camp, list your main offerings, and a clear call to action. Use your primary keyword phrase in the copy. Programs/Services Pages: Build a separate service page for each program you provide to increase the coverage of the keyword relevant to each one. It is very important to set up and configure your Google My Business account to help people find you in a local search. You can read more about how to do this here. Google reviews can help establish trust in your summer camp as well as improve your SEO. Getting online reviews helps build trust in your business (and can also have a positive impact on your summer camp SEO). Potential customers rely on reviews to make decisions, and it also helps Google learn more about your business, validate your trustworthiness and improve your search result page ranking. Reviews also are an opportunity to engage with your audience. Reply to all reviews – whether good or bad. Create a process where you send your satisfied parents an email with a link to your Google My Business profile, and directly ask them to write a review. The most important reviews for your business can be found in Google Map/Google My Business and Yelp. A citation is an online directory listing of your business information. There are likely many directories of camps and enrichment programs in your area, in addition to business listings such as your local Chamber of Commerce. Do some searching to find these directories and send your information to be included. A key to getting to the top of Google listings is inbound links from authoritative, credible websites. Build relationships with businesses that offer complementary services to your own, such as schools or community groups and share your content with them. You can scope out your competition using a tool like the Moz Open Site Explorer to see where they found their links. It is important to pay attention to your website’s performance in search results in order to make changes if necessary and see if your attempts to improve your ranking have an effect. There are several free quick ranking checker tools available, as well as some excellent (and expensive) tools that will check and send ranking reports on a set schedule. A good, basic free tool is SEOCentro Rank Checker. Start planning your strategy early so you are ready when camp registration kicks in! Contact us to discuss how to improve your camp website’s search engine results!